If you want to build a WooCommerce takeaway restaurant ordering system, you’ve come to the right place. I’m going to tell you everything you need to know about how to take takeaway orders in WooCommerce. 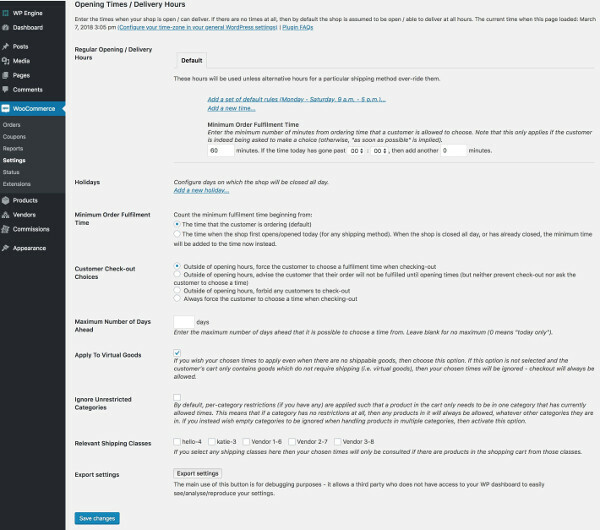 You’ll learn which WordPress plugins to use to add different features. We’ll look at how to list your takeaway foods as a one-page WooCommerce order form. You’ll discover how to set restaurant opening hours and delivery times so that people can’t order food when you’re closed. We’ll discuss an easy way to automatically print takeaway orders so that kitchen staff can start preparing the orders without delay. We’ll even look at extra plugins to boost your sales by rewarding restaurant customers for their loyalty via past purchase and repeat purchase coupons. Before you start, you need a WordPress website with WooCommerce installed. WPBeginner have an excellent step-by-step WooCommerce tutorial. This takes you through the overall setup of your WooCommerce takeaway store, including important features such as online payment gateways and delivery or collection options. Follow these instructions and then come back to this article to transform WooCommerce into a takeaway restaurant ordering system. If each food dish just has one option then add it as a ‘Simple Product’ in WooCommerce. If the dish has a choice of options (e.g. small and large) then add it as a ‘Variable Product’ with product variations. Or if you want to sell extra options such as pizza sauces or extra toppings, then get the WooCommerce Product Add-Ons plugin. This plugin lets you increase your takeaway restaurant revenue by selling extras. Choose between several types of options. Most takeaway restaurants use the checkbox option so that customers can tick all the extras they want for each dish. However, you can also add other types of field such as text fields for customers to add details of any special dietary requirements. You can add a price to each option, so the cost of each product will increase depending on which options they select. Once you’ve added each item from the menu as a product, keep reading. Next, I’ll tell you how to list the takeaway foods on your WordPress website so that customers can easily order online. WooCommerce and your WordPress theme come with standard store layouts. These are typically grid layouts, for example with 3 products per row and about 9 products or 12 per page. The main store pages show the product image, name and price, and you have to click to the single product page to view more information. Unfortunately, this isn’t suitable for a takeaway restaurant. When you order takeaway food, you don’t want to scroll through large images and multiple pages. Instead, you want to view all the foods and information on a single page. Ideally, this should be divided into sections for starters, main courses etc. just like a printed takeaway menu. You want to select all the foods you require, choose quantities and any extras, and quickly add to the cart and check out. That’s where WooCommerce Product Table comes in. All the takeaway dishes are listed on a single page. You can choose which columns of information to include in the table. This includes all the standard WooCommerce product data, plus extras such as custom fields and taxonomies. These are handy for displaying extra data about your foods. For example, use extra fields to label the vegetarian or gluten free options, or showing the calorie count. Customers can choose quantities, variations and any extra add-on options directly from the product table. There’s a check box next to each product so that customers can select all their products and add to the cart in a single click. As you can see, WooCommerce Product Table provides a much better way to present takeaway restaurant foods. It’s more user-friendly and will help to increase your sales. Remember – the easier it is for customers to place takeaway orders with you, the more likely they are to come back. Barn2 Media, the creators of WooCommerce Product Table, have created an in-depth tutorial about how to create an online restaurant ordering system using their plugin. Use this to create the perfect one-page order form for your takeaway foods. When you have a WooCommerce takeaway restaurant, it’s important that customers can only order when you’re actually open. That sounds like a no-brainer, but a lot of people don’t think about this! Your restaurant could get a bad reputation if customers order food online without realising you’re closed. No one wants that. The WooCommerce Opening Hours & Chosen Times plugin solves this problem perfectly. It comes with lots of flexible options for controlling your takeaway restaurant’s opening times and home delivery slots. You can keep it very simple, or use the advanced logic to get it working exactly as you’d like it. You can even add the typical lead time for order fulfilment – so if it takes you 1 hour to prepare takeaway food and delivery to the customer’s home, then you can set a fulfilment time of 60 minutes. Once you’ve set the WooCommerce takeaway opening times for your restaurant, the plugin will control when people can order a takeaway meal. It also lets them choose a delivery time slot. If someone adds products to the cart outside of your takeaway opening hours, then a prominent message will appear at the top of the cart. This will notify them that you are currently closed. It also mentions that they can check out by choosing an available delivery time slot. Then can then proceed to the checkout. In the checkout, date/time picker will appear for them to choose a delivery time for their takeaway meal. While customers can place the order straight away, they’ll understand that it will not be processed or fulfilled until your next opening time. It’s also possible to prevent people from ordering before your next opening time. Simply use the setting which controls how far in advance people can place an order. This is useful if you are closing your takeaway restaurant for a long period such as a holiday. Most WooCommerce takeaway restaurants like to automatically print their online food orders. The order prints in the kitchen, and staff can start preparing the meal immediately. There’s no need to remember to check emails or log into the WordPress dashboard to look for new orders. You can do this with the WooCommerce Automatic Order Printing plugin. 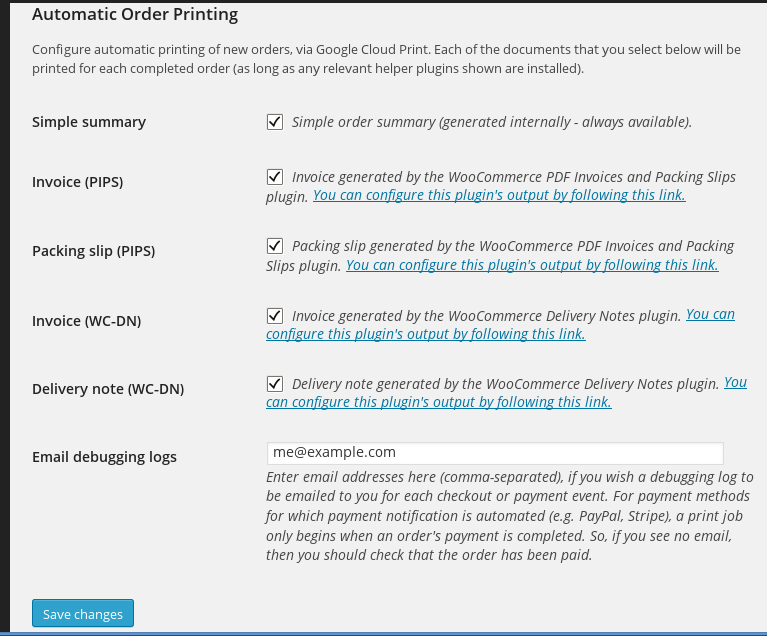 This handy plugin automatically prints your WooCommerce food orders to your takeaway kitchen printer via Google Cloud Print. This step is vital to avoid any takeaway orders being missed, but lots of WooCommerce restaurant ordering systems don’t do it. Finally, I’ll share two plugins that let you reward your WooCommerce takeaway restaurant customers. With such a crowded takeaway marketplace, you need incentives to build customer loyalty and encourage repeat purchases. You can do this by offering discount coupons for repeat purchases. WooCommerce Repeat Purchase And Renewal Coupons is a WordPress plugin that lets you offer discount coupons for repeat purchases. The discount voucher codes only work for logged in customers who have previously bought from you. As an alternative, WooCommerce Past Purchase Coupons is a WordPress plugin that lets you provide discount vouchers based on a customer’s previous orders. This lets you offer different coupons based on which specific products the customer has previously purchased. Use these plugins to create coupon codes and give them to your customers. Make it clear that the discount will only work for customers who have previously purchased from you. To boost your WooCommerce takeaway orders even further, you can automate your marketing to publicize these coupons. Integrate your WooCommerce store with MailChimp to automatically add all customers to a mailing list. You can then send automated MailChimp emails a set number of days or weeks after each customer signs up. The foll0w-up emails should include the past purchase coupon code. It’s a fantastic incentive to build customer loyalty and encourage repeat purchases from your WooCommerce takeaway ordering system. By combining the WooCommerce takeaway plugins featured in this article, you can create the perfect online order system for your restaurant. Use WooCommerce Product Table to list your takeaway foods in a one-page restaurant order form. Divide it into multiple sections, just like a real restaurant menu. Add WooCommerce Opening Hours & Chosen Times to set your takeaway restaurant opening hours and allow customers to choose a delivery time slot. Use WooCommerce Automatic Order Printing to automatically print your takeaway orders directly to the kitchen. Finally, add WooCommerce Repeat Purchase And Renewal Coupons and/or WooCommerce Past Purchase Coupons to provide discount coupons to encourage customer loyalty and repeat purchases. These plugins work perfectly together and should provide all the features you need for your WordPress takeaway order website. Get started today – you can do it yourself and won’t even need a developer!